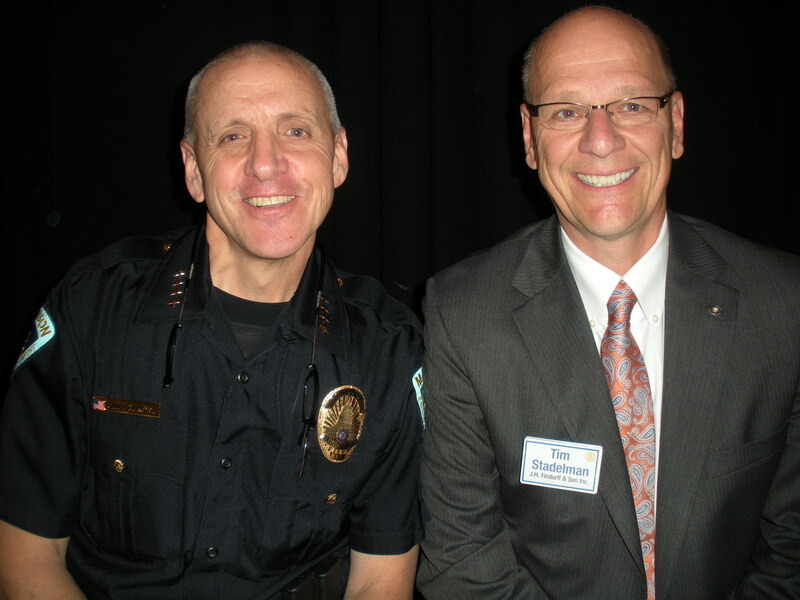 Chief Mike Koval of the Madison Police Department (brother of Rotarian Dan Koval), future Downtown Madison Rotarian – no pressure Chief! – and self-described “recovering journalism major” impressed the Wednesday luncheon meeting with thoughtful remarks about his first 3 months in the position. Instead, the Chief prefers connotations of the word “guardian.” A guardian operates under rules that ensure police officers are not reduced to the level of those who would do harm to the weak, elderly, infirm, or innocent. A guardian cares for people within his/her area of responsibility and seeks to work with others to build trust. Trust creates the ability to solve problems together for mutual benefit. Among those Chief Koval intends to protect are those suffering from mental illness. The Chief pointed out that earlier this year the State of Wisconsin made it more difficult for his police force to provide that protection. The Mendota Mental Health Institute is now closed to accepting adult males detained through emergency petitions. Instead, they need to be driven to Oshkosh to a facility there. That puts the patient at greater distance from his/her support network. It also makes two officers unavailable for other protective duties for about 5 hours. Tuesday night, the Madison Common Council granted the Chief permission to pursue a legal challenge to the State’s order. True to the character presented in the rest of his presentation, the Chief noted that he sees the Council’s action as offering him leverage to open dialogue rather than as a weapon to be used pre-emptively. When asked, the Chief noted that if members of the Club wish to provide support in his effort to change the State’s decision they should consider exercising their civic power to address state representatives and senators on the issue. This entry was posted in 2. Meetings, Weekly Rotary Guest Speaker and tagged Rotary, Rotary Club of Madison. Bookmark the permalink.